This online Ebird map shows locations across North America where Trumpeter Swans have been seen. Zoom in or out to see dates and locations of sightings near you! Thanks to Wisconsin Ebird for this link. You can zoom into any location in North America. This list of National Wildlife Refuges includes Refuges with Trumpeter Swans being reported at some point during their annual cycle. Heber Springs is home to many wintering Trumpeter Swans. Directions to Heber Springs's Magness Lake are included in the link. Nesting swans are on Silver lake. Harriman State Park is also an important wintering site for Trumpeter Swans. A brief review of Michigan's swan restoration program and best areas on the Au Sable River to view Trumpeter Swans. This article appeared in the Bemidji Pioneer in June 2018. Swans winter along the Mississippi River at Swan Park in Minnesota. Monticello has a live cam to see the swans, which can be seen between December and mid February in to early March. If they are not on the river, they may be out field feeding during the day. Many of the parks and preserves in Three Rivers Park District have Trumpeter Swans at some point during the year. Call to find out where they are during your visit to the Twin Cities. The Audubon Center at Riverlands, at the confluence area of the Missouri and Mississippi River near St. Louis, has the largest wintering population of Trumpeter Swans outside of Minnesota. The Center's Great River Trumpeter Watch, started in partnership with TTSS in 2011, tracks wintering swans including marked swans. Loess Bluffs National Wildlife Refuge has several hundred wintering swans each winter, sometimes numbering over 1,000. Red Rock Lakes was established in the 1930s specifically to protect Trumpeter Swans. This beautiful refuge has been at the heart of the return of the Trumpeter Swan to North America. Cygnets from Red Rock Lakes NWR were used in early swan restorations in the Midwest, as well as being shared with zoos to preserve the species. Southwest Montana's Centennial Valley is crucially important to the survival of Trumpeter Swans that nest in the Greater Yellowstone Ecosystem. During summer 2011, The Trumpeter Swan Society funded monitoring and research at over 30 historic nesting territories on private ranches and public lands west of Red Rock Lakes National Wildlife Refuge. 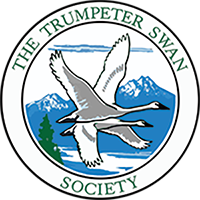 Summer Lake Wildlife Area is the site of the Trumpeter Swan releases for the Oregon Restoration Project, a partnership between TTSS, the Oregon Department of Fish and Wildlife and the United States Fish and Wildlife Service. Summer Lake is also a wintering site for swans as well as a rest stop for migrating Tundra and Trumpeter Swans.